What’s Happening in Craft Distilling? 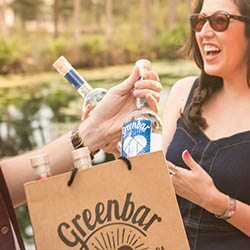 News from Greenbar Distillery founders, Litty and Melkon about what’s coming to craft distilling in 2018. You heard it here first! Inspired by immigration and migration, people not places will determine what we eat and drink. While a cyclical trend, this time it’s less about fusion or exoticism and more about cultural terroir, where a critical mass of cuisine from immigrant cultures in a region begins to shape regional food and drinks that further separate places like Los Angeles, Miami and New York from one another and the rest of the country. As more craft distillers hang out their shingles each week, they’ll have to prove they have something better and more memorable than the ones that came before. Let the games begin! Facebook Live or Castle Wars 2.5 just doesn’t cut it as human interaction. People will emerge from their self-imposed isolation to physically meet others in social settings like restaurants, bars and each other’s homes. Food and drink choices to align along the political divide. In liberal California, fresh produce cocktails that help support their values: local, organic, sustainable, to define consumption. Craft distillers will count on friends and family even more in 2018. With fewer distributors due to consolidation and more distilleries looking for a way to get to market, it’s easier to defend your turf than fight for glory further afield. Softening direct-sales laws will likely be proposed across many states to fuel this trend and mitigate the inevitable shuttering of many distilleries across the country. Every five years, gin tries to become a star in America. And fails. With more than 1,500 craft distilleries in the U.S. — almost each one offering a gin (or three) — 2018 is the year it turns from an indie darling into a celebrity. As consumers demand “cleaner” products, FD&C Blue No. 1 & FD&C Red No. 40 will take a backseat to natural golden and amber tones. Even for established brands. Feel free to declare your love for vodka in the open once again. No need to pretend the vodka/soda is just because you’re watching your calories. It’s now back, minus the candy flavors. Sure, straight vodka may be like looking at a white painting but, if you look deeply enough, those shades of white, beige and cream are subtly mesmerizing and, wow, do they ever show off anything put onto that canvas. Booze flavored chocolates notwithstanding, the addition of liquor and cocktail inspired candles, cologne and maple syrup mean mainstream acceptance of an erstwhile ‘bad habit.’ Sign us up for Negroni-scented dryer sheets. That’s per Impact Databank. Despite the challenges, we concur. End of year projections for the industry slated to approach 5.5 million cases. Will 2018 see 6.5 million cases? We’re betting on it. We’re enjoying the bitter taste in our mouths; 2017 sales of amari like Aperol & Campari increased by the double digits. The trend extends to our own craft distillery with increased sales of Grand Poppy amaro, our bitter-sweet ode to California. As palates become even more discerning, hooch has to step up or go back into the woods. It’s a nice touch but do you really need a grilled cheese garnish? Full disclosure: we made a toasted marshmallow garnish for a winter whiskey cocktail – lots of oohs and ahhs plus it tasted great – but we predict 2018 says goodbye to meal-sized, over-stylized garnishes.